A PMG is much like a synchronous generator in the fact that it can produce electricity on its own, with no external excitation (utility grid). This is unlike our asynchronous induction generators we use for grid tied applications. The synchronous generator based system is a standalone system that cannot accept any additional generation from other sources. So if you don’t have enough water, you may not have enough power. It is the simpler of the two options, as it is controlled only by PLC’s and relays. When determining the size and configuration of an off-grid system, it is critical to understand the pattern of your electrical usage; your average kW consumption, your minimum kW consumption and your peak kW consumption. It’s also important to attempt conservation measures before starting in order to reduce your need for electricity as it will reduce the need for a larger system and is usually the cheaper thing to do. An average house consumes about 1kw per hour on average (roughly) but peak loads when doing laundry, cooking can be up to 6kw’s or more. These load estimates assume your house is heated by a source other than electricity. To determine your peak demand for kilowatts that you are likely to use, there are a number of methods you can use depending on your situation. First, you have to decide on every electrical item (called loads) that you are likely to have on and consuming electricity at one time ie stoves, fridges, dryers, toasters, tv’s etc. Once they are all on, you need to measure the instantaneous consumption of kilowatts at that time. This is where the various methods to do so are involved. If you have a smart meter you may be able to see your consumption at any point in time. If you have a meter with a rotating dial you may be able to compute your consumption by timing its rotation. Or you may have to get your electrician’s help as they can use a simple meter on the power lines to measure your consumption. Once you have these things done this will give you a good idea of the requirements your off-grid system has to meet. Now it’s just a matter of how to meet those requirements. Below is a general description of the two types of off grid systems we offer. Greenbug’s PMG based system utilizes batteries for storage, and can accept power from other generation sources. For example it can accept solar panels or a wind turbine. This is nice when you have low water volumes/flows that otherwise won’t support your instantaneous peak consumption of electricity during low flow. It means you wouldn’t need to adjust your electricity usage pattern. An added benefit of this system is that your Screw Generator can be smaller (and less costly) to provide the same peak power load. This is accomplished by storing power that is produced when you are not using it (at night for example) in batteries. The PMG option is what we consider the “high tech” solution, as it does rely on inverters to control frequency and voltage regulation. Inverters are a well-known technology produced by many high quality manufacturers, and they are widely used in solar applications, but they don’t last forever. In order to properly size the Archimedes Screw Generator that is needed for a PMG system a Customer Load Profile needs to be developed. This load profile determines system and component sizing based on your average power consumption, peak power consumption, and minimum power consumption. 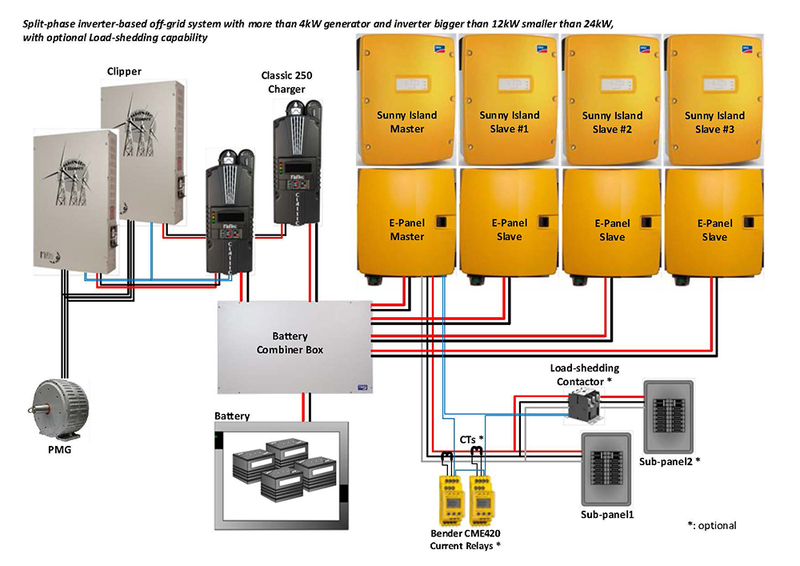 Inputs such as kwh’s to be produced by the screw generator are needed along with this information to determine inverter size, battery storage requirements, potentially required additional power sources such as PV or Diesel Generator. This system can be wired into a standard load center (breaker panel like you already have in your house), and you can individually run electrical circuits the same as you would in a standard residential build. In an existing house this is already done. We have defined and developed three main system structures. 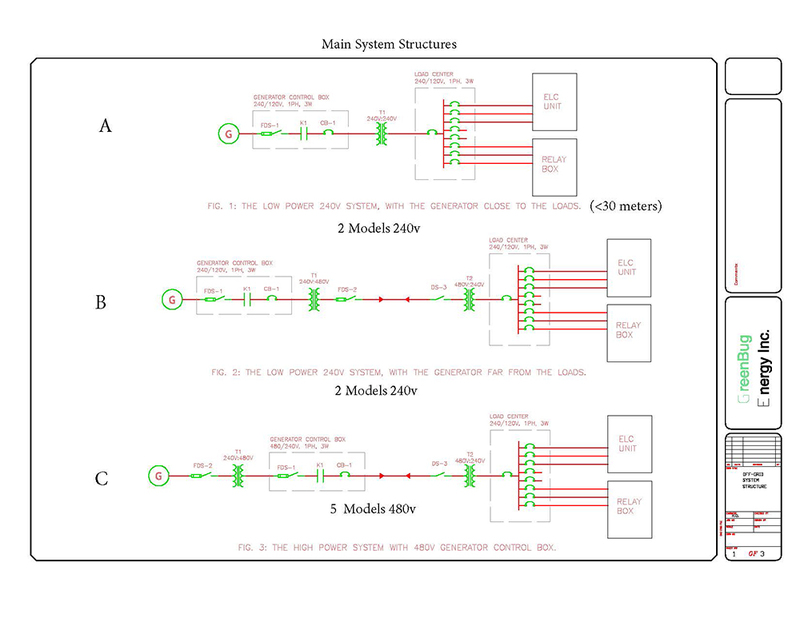 Below are schematic’s showing the basic electrical (component) layout of the three PMG systems. All systems are designed only to accept a screw generator of up to 4kW’s in size. This is because the consumer load profiles we ran to develop the PMG system, never had a requirement for more than 4kW continuous power for even large residential loads. 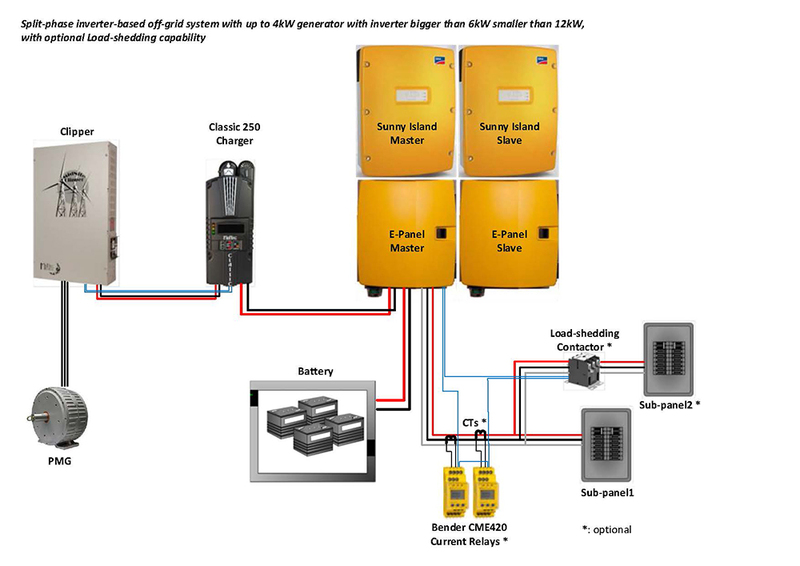 In a SG-based off-grid system the two main tasks of frequency regulation and voltage regulation are not performed by an inverter. Instead the voltage regulation is performed by the automatic voltage regulator (AVR) circuit, which comes with the generator. The frequency regulation is performed by an ELC (Electronic Load Controller) unit which does so by maintaining the balance between the generated power and the consumed power. If there are not enough loads to consume the generated power, the excess power is diverted to dump loads by the ELC. We have defined and developed three main system structures; A, B & C.
The first generator control box (240V, 60amp) is for generators of up to 9.2kW maximum. Generator size options are; 6kW or 7kW. BSystem Structure B is for use in situations where the generator cannot be close to loads where the power is used and the generator ranges in size from 6kW to 17kW. This is accomplished by use of the same 2 possible models of Generator control boxes as above, but transformers are used to step up the voltage to 480V to transmit the power further to where the loads are located at which point the voltage is stepped down again to 240V. The second generator control box (240V, 125 amp) is for generators of up to 19.2kW maximum. Generator size options are; 10kW, 12kW, 15kW or 17kW. The second generator control box (480V, 200 Amp) is for generators of up to 61kW maximum. Generator size options are; 48kw, 50kW or 60kW. The third generator control box (480V, 260Amp) is for generators of up to 80 kw – The only generator size available is 80kW. The fifth generator control box (480 V, 400amp) is for generators of up to 125 kw. The only possible generator size available is 125kW. All generators are 240V generators. You can hook up 240 or 120 Volt circuits to any of them. As this system can-not accept the addition of batteries or other sources of power you need a larger screw generator to produce the same instantaneous maximum power you expect to use. Generator Control box – controls the main contactor to the generator and controls the brake on the screw and performs protection tasks such as under and over voltage, under and over frequency, over current, and over load while measuring and displaying system parameters on a panel mount meter. Takes the turbine off line if there is a problem. Load center (1 or more breaker panel ) – This is just like the breaker panel in your house. 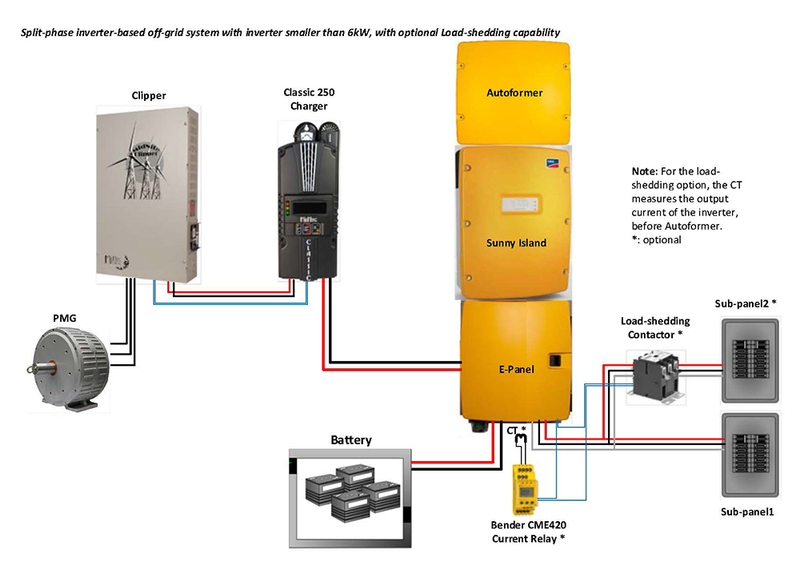 Power comes into your load center from the generator control panel instead of the grid in off grid systems. For each circuit in the load center, the power goes out to either a circuit in the electronic Load controller (ELC) or a circuit in the relay box. ELC unit– Each circuit in the ELC goes out to dump loads only. These dump loads have to be equal to the size of your generator. The ELC regulates frequency by balancing consumed power in your house with available power by load switching or shedding. The ELC unit controls power to each circuit of dump loads in the ELC, it also controls individual circuits in the relay box, turning them off or on based on power available and the prioritization you’ve setup. Relay box(s) – each circuit is connected to a circuit in your house. The relays in the relay box that sends power to each circuit in the house is controlled by the ELC. Fused and non-fused safety switches (based on system layout) – are just standard electrical protection devices. In the diagram below you will see these main system components and how they are laid out in the system.